Adapted from a recipe in Ancient Grains for Modern Meals by Maria Speck, although, I used a different pizza dough recipe entirely, so there were no ancient grains here. If you want to try the original Spelt Crust, the recipe is here. 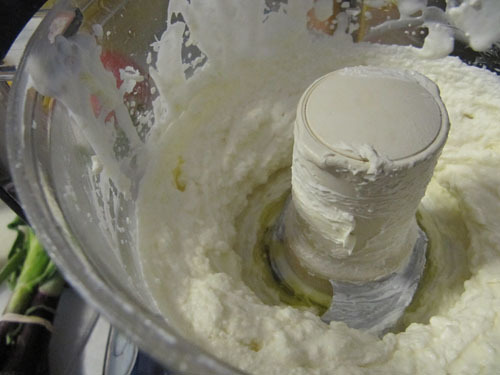 Olive oil for drizzling, etc..
Add the yogurt, marscapone, and 3/4 cup mozzarella to a food processor and process it up well. Add about a tablespoon or so of olive oil to help smooth it out. You can also do this by hand, but make sure the marscapone/cream cheese is at room temperature, so it’ll be easier to mix all together. Season with a little salt and pepper. Set aside. Fry up your bacon. 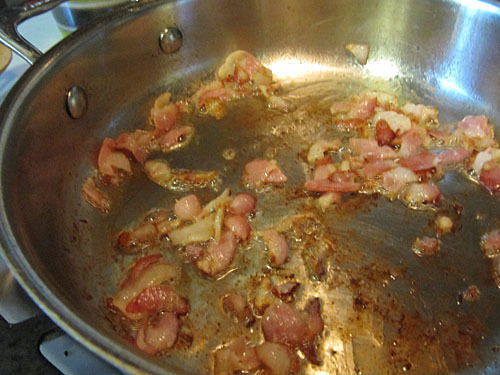 Try not to eat many of the bacon crumbles when they are done. Hey there, you need those for the pizza! 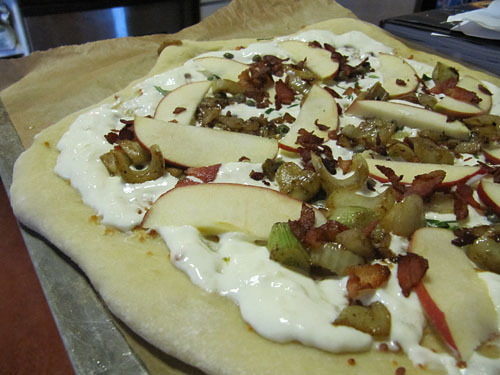 Preheat the oven to 450 degrees F. Roll or spread out the pizza dough on a peel or baking sheet. I usually use a parchment paper-lined sheet that I can slide off onto my pizza stone in the oven after I get all the toppings onto it. 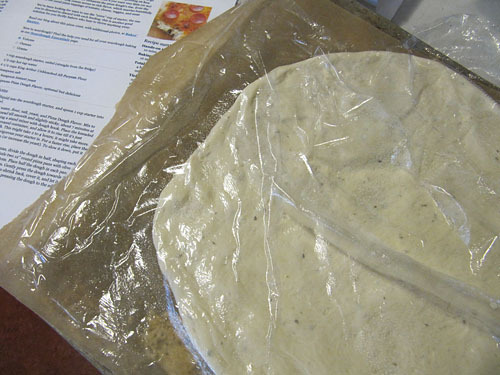 Drizzle and brush a little olive oil onto your rolled or pressed out dough. 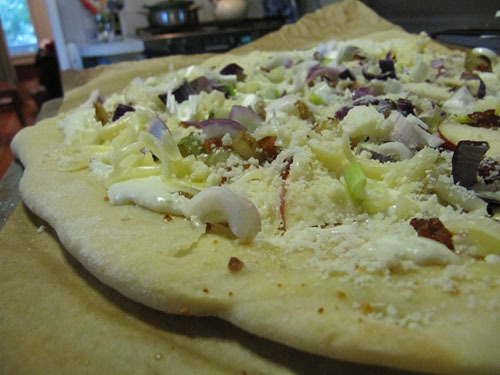 Sprinkle half the Parmesan cheese on top and get the pizza dough in the oven for about 5 minutes for a quick pre-bake. Now it’s time for the real toppings. 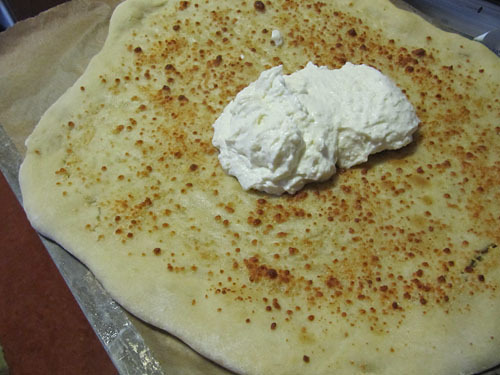 Spread the yogurt/marscapone/mozzarella mix out on top of the pizza. Leave about a 1-inch border all around. Then sprinkle on the capers, garlic and rosemary. Next, lay out the apple slices and fennel. Finish it up with the crumbled bacon, green onions (or shallot) and your reserved 1/4 cups mozzarella and Parmesan cheeses. Bake for about 15 minutes or until golden and bubbly. Let sit a minute or two then slice up and devour. This is especially good with an arugula salad on the side with balsamic vinaigrette and candied walnuts. 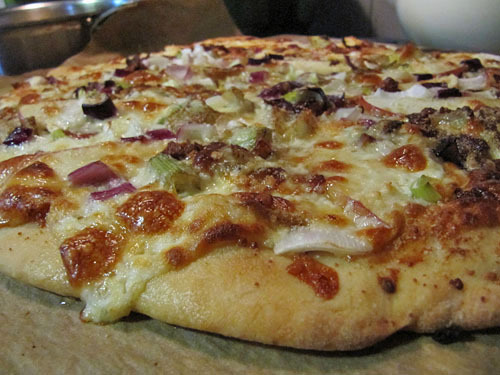 Love your creative take on my Spelt Crust Pizza. Fantastic! It looks beautiful and I would love a slice for lunch—right now…. I just posted a link to my Facebook fan page “Ancient Grains for Modern Meals”. Stay in touch, and let me know if you ever try the spelt crust version which uses fresh ricotta in the dough to add moisture. It’s easy! Hi Maria: Thanks so much for commenting! I actually love your cookbook, we have a copy of it at work and I have ear-marked many recipes to try at home! GAH! Oh! Oh My God! $@#! This was amazing! 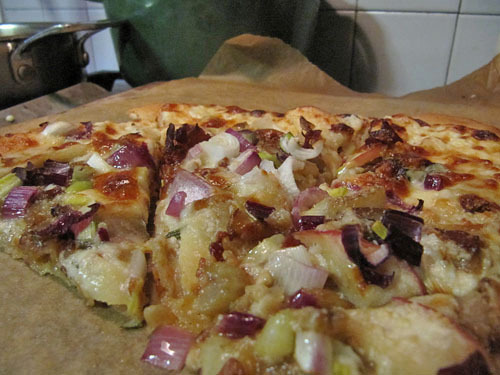 I jus-…ROSEMARY AND APPLE IN BLESSED UNION! SO GOOD! I need a cigarette and a cuddle.